Most cartons manufacturers have a printing die-cutting and slotting machine that integrates printing, slitting, and indentation production functions. The equipment is simple and convenient to operate, the degree of automation is relatively high, the quality is easy to control, and it plays a certain role in the carton production process. The role. However, if the equipment ages and the machine is improperly adjusted, some malfunctions are likely to occur during printing. The common problems encountered in the production process are now categorized and analyzed. Quality defects caused by defective components of the machine impression: When the plate cylinder head, the platen roller head, the drive shaft, the gear, and the important parts associated with the embossing are worn and loose, during the imprinting process, The plate roller or the embossing roller can thus cause a bounce or slip phenomenon. Due to the unstable pressure, the contact between the printing plate surface and the paperboard is not normal, resulting in the problem that the paperboard printing surface has the problem of stencil printing or local image printing. Through careful observation and analysis, the exact location of the fault was identified, and appropriate measures were taken to deal with it. The worn and loose parts were repaired to eliminate the fault phenomenon. Quality failure caused by bad ink roller: When the ink roller head is loose, the ink roller roller body is bent, deformed or the surface is damaged, it will cause the layout dirty, paste plate or local image is not clear. Should find out the reasons, take appropriate measures to deal with, so that the ink roller and the printing plate to maintain uniform and appropriate contact conditions, replace the damaged ink roller, in order to eliminate the phenomenon of failure. Quality failure caused by improper adjustment of the pressure roller: If the position of the pressure roller is too high or too low, so that the contact with the corrugated cardboard is too tight or too loose, dirty prints, stencils, or partial image imprinting may occur. The pressure roller should be adjusted to a suitable position so that the gap between the pressure roller and the roller can be adapted to the thickness of the cardboard to ensure the position of the printing plate to avoid the occurrence of the fault phenomenon. Quality failure caused by improper color sequence: If the layout with fuller layout is printed in the first color group, when the corrugated cardboard enters the printing process of the next color group, the amount of ink in the printing image of the first color group of the cardboard is Large, slow drying, it is very easy to cause the imprint to be dirty. In order to prevent this problem from occurring, it is advisable to arrange small-size layouts in the first color group, and to arrange large-size layouts in the subsequent color group to avoid imprint migration caused by dirty printing. Quality failure caused by uneven thickness of printing plate: When the thickness of the rubber plate is not uniform, height difference will occur on the plate layout. If the layout is high, it will be easy to paste, and if the layout is low, the ink will be incomplete and the print will be unclear. In order to avoid this unfavorable situation, the plate can be made into small pieces (referring to the plate-making process that saves the rubber plate and the plate-making core). The same plate material should be used for the production, so that its thickness difference is relatively small. If the already prepared rubber plate has a poor thickness, it can be compensated by a multi-adhesive layer on the back of the partially thin plate, so that the entire plate can maintain a substantially uniform thickness, ensuring the printing pressure and the evenness of the printing surface of the plate. Quality failure caused by non-uniform thickness of corrugated board: If the surface of the formed corrugated board has a sabotage mark, the paper surface of the recessed area will also have unclear quality defects. If this is done to increase the printing pressure, it is easy to make up for it. Make the text, line layout appear to be a quality problem. In order to prevent the layout from becoming lumpy, corrugated cardboard should be handled lightly, lightly, lightly (to control the stacking height) during stacking and handling, and should not be transported in such a way as throwing, picking, or pressing. The position of the printing caused by the curling of the corrugated board is inaccurate: If the corrugated board has a warp defect, the slipping phenomenon is likely to occur during the positioning and feeding of the board, and even the rules on the machine do not touch the edge of the paper. The print position of the board is inaccurate or unstable. When printing on warped corrugated cardboard, try to use a relatively flat edge of the paper as the regular edge of the paper when feeding. The most important is the control of the source of quality. Through the reasonable control of the single-sided machine operation process, the speed and preheating temperature of the machine, the moisture content of the base paper and the preheating area are in a relatively coordinated state; when comparing the paper, attention is paid to comparing the moisture content. Closed boxboard paper and corrugated paper are used for supporting the synthesis of corrugated paperboard. The corrugated paperboard produced by this method is relatively flat and can ensure the accuracy of the printing position. Improper operation process caused by the inaccurate printing position: If the position of the plate is improperly installed, the position of the printing on the layout may be inaccurate. Because corrugated paperboards with warpage defects have just entered the plate cylinders, if there are traces of slippage, the tip of the paperboard will show significant deflection. Therefore, the corrugated cardboard has a colored layout, and the paper should be positioned as far as possible at the starting position of the roller, and corresponding measures should be taken to repair it. After the loosening of the components is eliminated, the printing position of the corrugated cardboard can be ensured accurately. Inadequate positioning due to machine defects: When the machine's chain, rules and other parts have loose phenomenon, it is easy to cause layout printing position to be inaccurate, this should take appropriate measures to repair, eliminate the loose parts phenomenon, can guarantee Corrugated board printing position accuracy. Some of the above-mentioned quality problems that often occur during printing are caused by bad equipment and some due to improper operation. Therefore, in the meantime, we must do a good job in equipment maintenance, but also strictly require correct operating procedures in order to effectively prevent or reduce the emergence of quality problems, so that the production efficiency and product quality are synchronized to improve. Power Bank Printer with the print size of 28*60cm, has C M Y K and 4 white color, which can print directly on plastic,metel, PVC, leather as well as PTU case. This product used for industrial production. 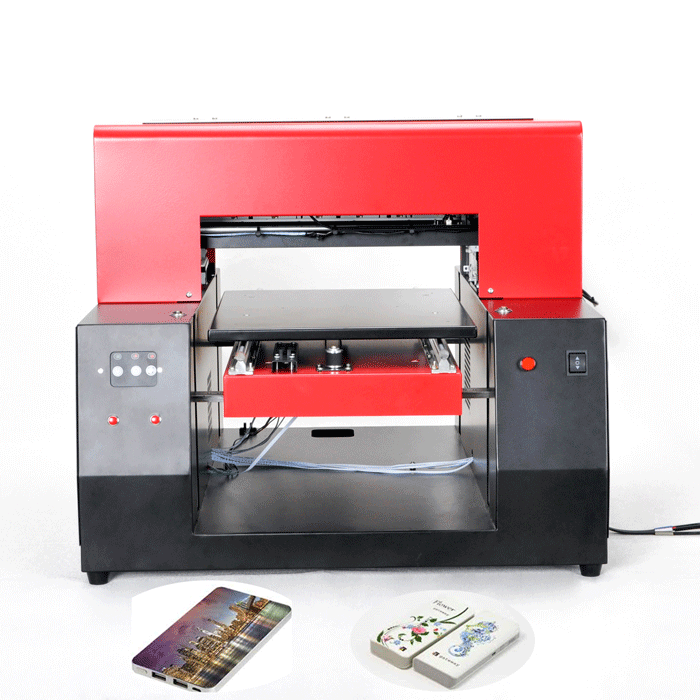 It combines fast printing speed and elegant design at a suit, make the digital printing production to become a reality. With its futures:high brightness, clearness and resolution, good color recovering and long service life, here we'd like to share with you about our UV Phone Case Printer's color reducibility. Printing out 3D and embossing quality available, this power bank printer can also print directly on the black and any other deep color cases.